If you want to be scared out of your mind, I suggest you choose a different film - Paranormal Activity perhaps. The other side of the door was an idea that had some potential, but it definitely doesn’t live up to it. The horror genre has evolved from what it was back in the 1970s and '80s, with icon films like Halloween and A Nightmare on Elm Street. I'm not sure that evolution is for the better, because even though graphics and special effects have advanced, the plots, scares, and goriness haven't necessarily improved. The Other Side of the Door is just another of the newest horror films that doesn't necessarily scare the audience. Maria (Sarah Wayne Callies; The Walking Dead) is inconsolable after her son drowns when their car goes off a bridge. She and her younger daughter manage to escape but Oliver (Logan Creran; Steel) is trapped and dies. She blames herself for not being able to free him and can't bear the thought of living without him even, though her daughter, Lucy (Sofia Rosinsky; Bloodline) and Husband, Michael (Jeremy Sisto; Suburgatory) are still alive. One day, after a failed suicide attempt, their housekeeper, Piki(Suchitra Pillai; 24: India) tells Maria of an abandoned Temple near where they live in Mumbai. Piki tells Maria what to do to allow her to speak to her son one last time, but is adamant that Maria not open the door. Of course, Maria does it anyway and unleashes the evil spirits, including her son, to haunt her home. The only way to send him back is to burn anything tying him to the physical world, but things don't necessarily go as planned. There are so many things wrong with this movie I'm not quite sure where to begin. The acting isn't great, especially from Rosinsky. Even though she is young, I found her to be incredibly annoying. Callies and Sisto aren't much better. I was surprised that they were not very good since they have both been better in other projects. Besides the acting, the special effects are fairly low budget. The demons aren't very terrifying and the gruesome "undead" aren't all that gruesome. The story is unbelievable and the portrayal of the Indian people is decidedly stereotypical. The "jump scare" tactic isn't very scary which makes the film not work overall. The Blu-ray is presented in 1080p high definition video with a 2.39:1 aspect ration and DTS-HD master audio 5.1. Interestingly though, the quality isn't all that great, but I wonder if that was done on purpose to help set the atmosphere of an impoverished country. The extras include deleted scenes (with one unintentionally hilarious scene of Lucy holding up the fakest severed dog head), Behind the door, Theatrical trailer and a gallery. All of the extras can be skipped without missing out on anything important. The real tragedy of the movie is the death of Oliver and the overwhelming feeling of loss. I suppose the movie tries to tap into those emotions associated with the death of a child and the devastation it wreaks on a family. On that level, the movie hits a nerve, but, as a horror movie, it misses on every level. If you want to be scared out of your mind, I suggest you choose a different film - Paranormal Activity perhaps. The other side of the door was an idea that had some potential, but it definitely doesn't live up to it. 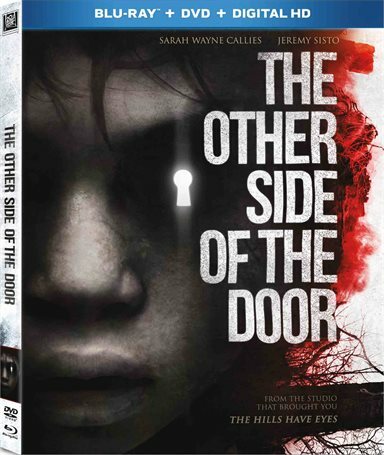 Download The Other Side of the Door from the iTunes Store in Digial HD. For more information about The Other Side of the Door visit the FlickDirect Movie Database.